Ok guys, Below is the show that we shall be riding too as the 59 Club O.C. Section, looking forward to seeing many other great people there for this show and I am certain there will be many cool motorcycles and cars to look at and enjoy. there will be a few of us riding from Alea’s cafe and it should be a fun ride and, any others are more than welcome to join us for the ride to the Seal Beach Motorcycle show, there will be plenty of stuff to look at for sure and I look forward to seeing you. Ride fast but Safe! Meetup at Alea Cafe at 10:00 and ride to the show. Kickstands up at 11:00 sharp! Whether you are a fan of 2 or 4 wheel vintage vehicles, the 28th Annual Seal Beach Classic Car Show has something worth getting revved up about! Spearheaded by Tankfarm & Co. in Seal Beach, the First Annual Seal Beach Vintage Motorcycle show will feature up to 75 vintage bikes, including European favorites, BSA, Royal Enfield’s Bullet, Triumph’s classic Bonneville series and BMW. Japanese brands Honda and Yamaha will be on display as well, and it wouldn’t be a vintage motorcycle show without the American classic Harley Davidson. Many of the classic bikes on display will be Cafe Racers, Sport Classics, Trackers and Bobbers. The term “Cafe Racer” comes from motorcycle enthusiasts of the early 1960’s who raced from café to café, sometimes exceeding 100 mph (referred to as ton-up boys). Sponsors of the Vintage Motorcycle Show include Bell Helmets, Roland Sands Designs, Schott NYC (the original biker jacket) and Deus Ex Machina. The Seal Beach Classic Car Show is free and open to the public, with ample free parking again this year, at the Naval Weapons Station in Seal Beach (Liberty Gate, at Seal Beach Blvd. and Landing Street), with pedestrian and shuttle access to the show. 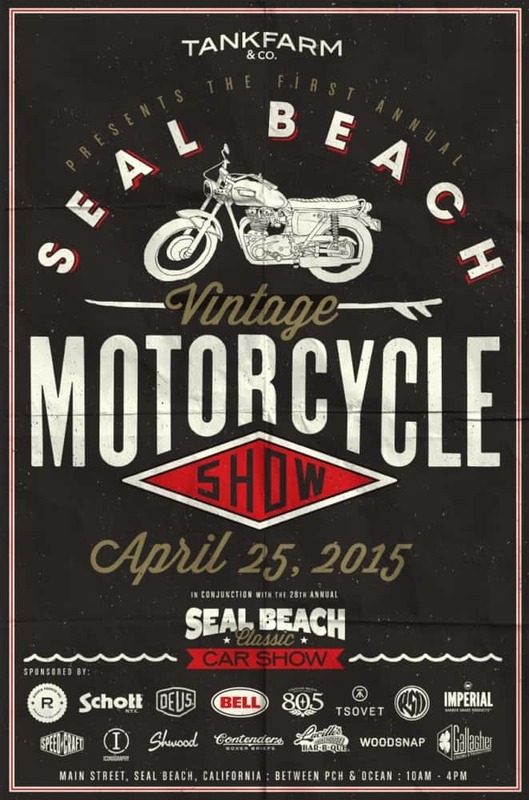 The show takes place Saturday, April 25, 2015 from 10:00 a.m. to 4:00 p.m. on Main Street in Old Town Seal Beach. Car and bike enthusiasts ranging from locals and passersby to extreme aficionados will spend the day viewing 540 vintage cars in nearly 30 classes at this judged event. Festivities include live music throughout the day from bands on two stages, nostalgic displays, a Pinewood Derby and celebrity appearances. The 28th Annual Seal Beach Classic Car Show is an official event of the Seal Beach Chamber of Commerce and could not be produced without the support of generous sponsors, including Presenting Sponsor – Original Parts Group, City of Seal Beach, Sun Newspapers, Russo & Steele Collector Car Auctions, Back in the Day Classics, Tank Farm & Co., Chevron, and G&M Oil Company. It will be great if you want to come along and join us, this is all about what we are into so try hard to make this event as it needs to have a good attendance to be able to have others. This entry was posted in Blog and tagged 59 club, ace cafe, bonneville, British Motorcycle, BSA, cafe racer, carpy, cb350-4, classic motorcycle, custom, Honda, hot rod, leather jacket, rockers, royal enfield, skid lids, sohc, thruxton, ton up, triumph, trumpy, Woody.